Version 6.0 of VirtualBox, Oracle’s open source virtualization software for Windows, MacOS, Linux, and Solaris hosts, introduces an overhauled interface and the ability to directly export VMs to the cloud — as long as it’s Oracle Cloud. VirtualBox users with Oracle Cloud Infrastructure accounts can enable the VM export feature by adding a profile for their cloud account into VirtualBox. It’s theoretically possible for VirtualBox to extend this feature to include additional cloud environments, but for now Oracle is choosing to limit the support to its own cloud. This despite Oracle Cloud falling far short of AWS, Azure, Google Cloud, or IBM Cloud in customer adoption and use. 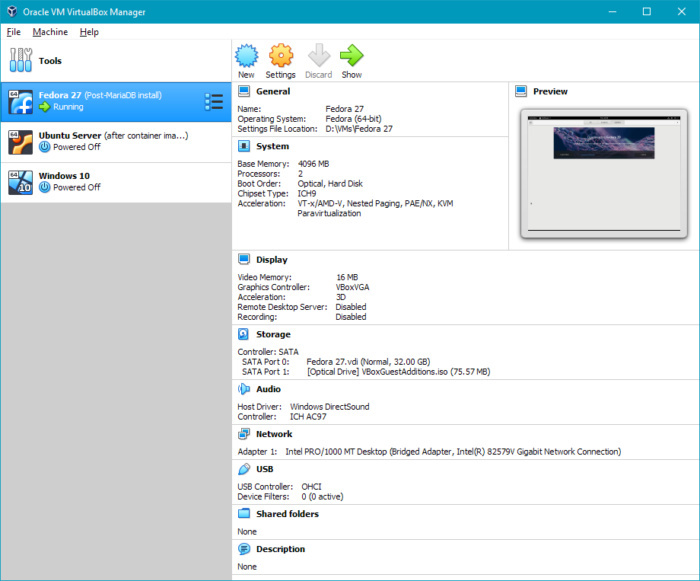 The biggest outward change for VirtualBox 6 is an overhauled UI. Navigating the application is slightly less confusing than before, and less digging is required to find any given feature or setting, with most everything important now found in the File menu. Instead of “Machine Tools” and “Global Tools” drop-down menus, a single “Tools” panel shows the most common functions (create, add, import, or export VMs) and provides a submenu for more involved functions (managing VM media, network adaptors, or cloud connectors). VirtualBox 6 features an overhauled interface that requires less pawing through different menus to find the tools you need. A new file manager interface addresses a longtime complaint of VirtualBox users — that there has been no convenient way to shuttle files between guests and hosts, or to explore guest volumes. The file manager interface allows the host to log into the guest, mount the guest’s file system, and copy files back and forth as needed. However, this only works when the guest has VirtualBox’s Guest Additions installed. Under the hood, VirtualBox 6 on Windows can now use Hyper-V as a fallback execution engine to allow VMs to run in all cases, if at the cost of some degraded performance. Another change, which was sniffed out by Alex Ionescu, suggests that a future revision of VirtualBox could permit nested hardware virtualization, allowing VMs to run inside VMs — another longed-for feature. Other changes include support for Linux 4.20 guests, an overhaul of 3D graphics support on Windows, Linux, and Solaris guests, and the dropping of support for 32-bit hosts. Anyone running a 32-bit host will need to use VirtualBox 5.2, which remains supported until July 2020.